The present lot is carved from stone of exceptionally good quality and of a remarkably good colour in the tone of "lychee flesh". 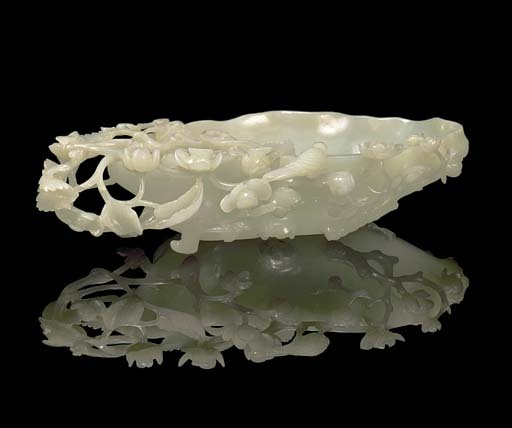 A lotus vase carved in a very similar style was exhibited at the Victoria and Albert Museum, Chinese Jade Throughout the Ages, Oriental Ceramic Society, London, Catalogue no. 408. Compare also a bowl in the Palace Museum, Beijing, illustrated in Zhongguo Yuqi Quanji, vol. 6, p. 207, no. 299.